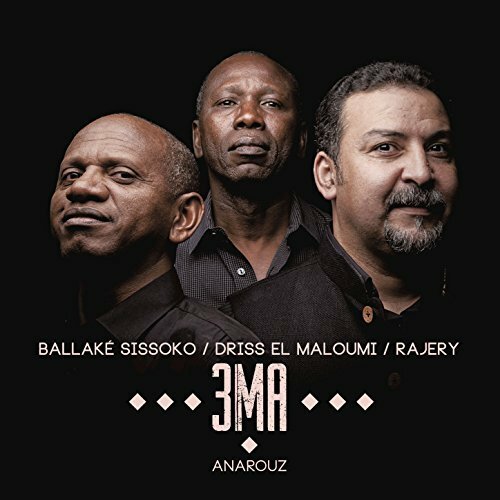 3MA is the meeting of three string-instrument virtuosi, Ballaké Sissoko (kora), Driss El Maloumi (Oud) and Rajery (valiha), all three are symbolic of their countries in Africa. Centuries of kora musical traditions run through Ballaké Sissoko’s fingers. In 1997, together with his cousin Toumani Diabaté, he recorded New Ancient Strings, which refers to the very first kora instrumental album, Ancient Strings that their fathers had recorded 30 years before. As a member of the Instrumental Ensemble of Mali, Ballaké started playing all over Africa, then in Europe. He later formed his own troupe in France before gradually gaining international recognition, since their debut record in 2008. The new album, Anarouz, bears witness to their wonderful connection and mature experiences. The three string players also sing, on one track each. Percussionist Khalid Kouhen joins in on two tracks to add delicate pulses with his Pakistani percussion and Indian tabla. Each piece has a unique chemistry in which individual parts meld to form a whole that is musical, invigorating and universal in positive emotions. That’s the short of it! Ballaké Sissoko (Mali) is a kora maestro, Driss El Maloumi (Morocco) is an oud virtuoso and Rajery (Madagascar) is the leading valiha player in his country. Combined, the three create a sound that combines traditional and contemporary World Music, fusing African folk, roots and various types of global sounds into a joyful sound that is 3MA. The three string players have a common thread of Arabic music, coming together and fusing the different string instruments, that is the core and passion of Anarouz. There is no mistaking the chemistry and rich expansiveness of the melodies and improvisations. These pieces are co-composed, and even though the solos are improvised, the three listen with intent on creating a solo that is just as melodic and full as the original melodies. True virtuosos know that music comes first, and these three show exactly what happens when sympathetic ears work together for the greater good of musical artistry.